You know about the Proverbs 31 Woman. She’s kind. She’s hardworking. She’s trustworthy. She’s valuable. She’s wise. While we’re not told much about her husband, we do know a few things: he trusts her, he praises her, he’s well-known. But if we look beneath the surface we can learn a lot more about them both! She’s not just called wonderful. She IS wonderful. The Proverbs 31 woman is being blessed and praised because of what she is and does, not because she exists. Every wife has a right to love. Every wife doesn’t have a right to this kind of praise. Every wife isn’t wonderful and awesome. Sorry, but it’s true! I’m not saying this to make you feel bad because you don’t measure up to this amazing (talented, energetic—and probably much older than you) ideal woman. I’m telling you this because I believe that your awesomeness can be just as genuine. She’s worthy of praise. You can be to. You do not have to be the ideal woman (that’s her job—a flawless example to give us direction) but you can be wonderful and deserving of praise. She does a lot of different things—and apparently does them well. I don’t think we’re supposed to take Proverbs 31 as a to do list or a checklist of skills we should have. But—wow! Is she ever skilled! She’s not a perpetual novice. She’s not ignorant. She’s not bumbling around just barely making it. She’s taken the time to invest in the things she needs to do so that she can actually do them justice. She wasn’t born the way she is. She had to learn everything she knows and learn how to do everything she does. She had to listen to God. She had to do things. To try things for the first time. To make mistakes (because no one is born knowing everything and nothing is perfect the first time). She had to take risks (She had to be careful too. You don’t get her kind of success without being careful). She had to develop her skills and learn from her experiences. She is a woman who is accustomed to being open to learning and growing. If she wasn’t, she wouldn’t be who and what she is. He’s the one sitting among the elders of the land. He’s the one known in the gates. And she’s okay with that. She has her place, he has his. She has her roles, he has his. She has her gifts, he has his. Their marriage isn’t a competition—it’s a partnership in virtue. She’s obviously a generous person, but I’d like to point something out. Neglected husbands and children don’t rise up and call their wife and mother blessed. Neglected husbands and children are not impressed. They wonder why she lavishes love and devotion on strangers while they come and go as strangers in their own home. Besides this, the verses of Proverbs 31 clearly point out that love and care for her family. “She looketh well to the ways of her household . . .” (Proverbs 31: 27), for example. She’s all about the home, whatever else she does. Proverbs 31:11 says, “The heart of her husband doth safely trust in her . . . .” Usually, we think about how she must be trustworthy in order for him to “safely trust in her” and that’s good. I think that’s the main point. But you know something else this verse says? He’s willing to trust her. A man doesn’t trust his wife merely because she’s trustworthy. That’s only half of a trusting relationship. He also has to, himself, choose to trust her. To not question her every action, to not suspect her motives, to not assume she will secretly do him ill. To believe her words, to not misconstrue her actions, to rest in her love. Trusting is hard. Yes, trustworthiness in the other person has a lot to do with it. But not everything. The Proverbs 31 woman is kind of awesome. Her husband is kind of awesome too. You know why? Because he has sense enough to know that she is awesome. He has the decency to appreciate it. He has the courtesy to actually express his appreciation. I probably don’t have to tell you this, but there are some men who don’t have what it takes to appreciate a woman being trustworthy. Maybe because they don’t value trustworthiness. Maybe because they don’t value women. And the same goes for everything else on the list. Some husbands would criticize the Proverbs 31 woman because she wasn’t good enough or didn’t do things right. Others would restrict her so, be such a discouragement to her, drain her energy, keep her heart in such a turmoil that she would not be able to reach her potential. Others would keep her so busy doing extra work he unnecessarily caused, or doing her work and his work too, or even protecting their children from him that she wouldn’t have time to be awesome. Some men just wouldn’t value things like a well-ordered household, efficiency, hard work, wisdom, kindness, caring for the poor. Some men could appreciate her and all she is and does—but somehow miss the importance of actually saying something nice about her or to her. But not the Proverbs 31 husband. This guy obviously has it together. He knows her worth. He appreciates her worth. He expresses his appreciation. That’s pretty awesome. He may, indeed, be the head of the family. If he is known in the gates, surely he is not an outsider in his own home. If he’s an elder in the land than surely he is also in his own home. I don’t see any conflict here with, say, Ephesians 5: 22-25, but I do see something else: He’s no dictator. He doesn’t script her life. He doesn’t think for her. In fact, he values her wisdom. He values her managing and decision-making ability. I’m sure if we could see the story behind what is written, we would see interaction between husband and wife behind every verse. But I don’t think we would see a controlling, overbearing man, with an inflated idea of his own value and position, and a deflated idea of his wife’s value and position. The Proverbs 31 woman is an active, capable woman—and it is partly due to her husband’s worth that she is able to be that. The account of the virtuous woman begins by introducing her as “a virtuous woman.” It’s not a particular virtuous woman with a name—it’s any virtuous woman. An ideal. But notice how this ideal woman’s husband praises her. “Many daughters have done virtuously, but thou excellest them all” (vs. 29). Hmm. There are quite a few virtuous woman out there, according to this man, but he thinks she’s the best. This isn’t a specific man with a name. He’s the husband of an ideal. If we really turn this ideal into reality, then EVERY husband of EVERY virtuous woman will think his wife “excellest them all!” Because, to him, she will! While he does recognize the worth of many other women, his praise is for her. He’s impressed, not merely with virtuous women, but with his own wife. If he didn’t, he wouldn’t value this woman so highly. The Proverbs 31 woman fears the Lord. The woman who fears the Lord shall be praised (vs. 30). Her husband praises her. He obviously values the fact the she fears the Lord, as well as the woman that makes her. Men who don’t fear the Lord don’t appreciate the fear of the Lord. Look at what the fear of the Lord does in this woman’s life. What do you think it might do in a man’s life? 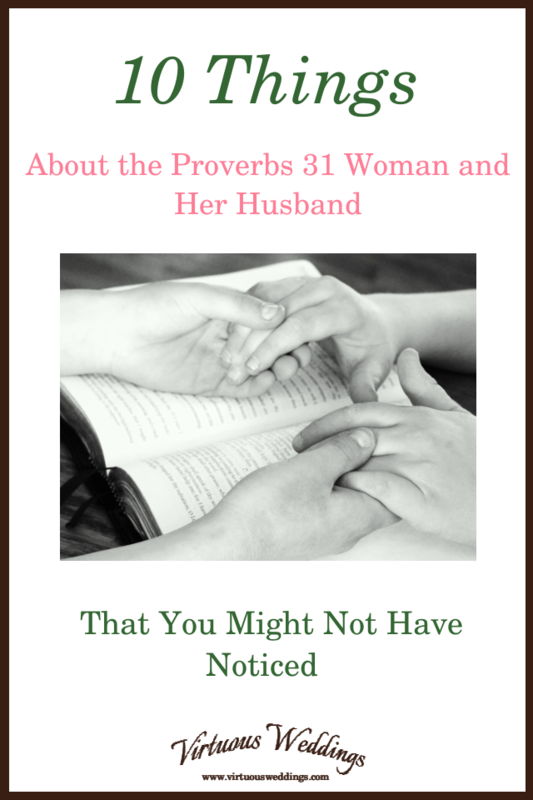 Well, there you are: ten things about the Proverbs 31 Woman and her husband that you might not have noticed! How might these things affect your life—and your marriage? This is a great article. I believe this info can help young women see things in the right light. 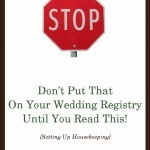 Having the right information can help wives going through difficulty. Thank you.That he fears the Lord is very profound to me.Men who fear the Lord are very different.